I eliminated all grains from my diet for over a year and just recently started introducing some sprouted gluten-free grains back in. For most people struggling any autoimmunity issue, removing grains from their diet can be one of the main components to helping them heal. (Which I believe it did of me) But I also try to listen to what my body wants and when I found myself really craving grains I decided maybe it was time to start slowly reintroducing some sprouted grains back into my diet.
" The sprouting process involves soaking the grains or nuts in water in a controlled environment until they begin to sprout, making it a living food. During the sprouting process enzymes inhibitors are broken down - making the nuts or grains easier to digest and also increases the absorption of vitamins and minerals in the body. " One of the things my body craved most when I wasn't eating grains were oats! So needless say they were one of the first things I made! And this was actually a perfect day for them. It was cold and rainy and I knew my typical morning green smoothie definitely wouldn't cut it. I think when people think of oats they typically think of a sweet, sugary breakfast. As I typically do myself. And that's where my problem arose: I want a warm bowl of oatmeal. I don't want sugar or anything sweet though. But I really want oats! This went on for a few minutes...as well as the opening and closing of the pantry and refrigerator doors until I finally saw my bone broth and figured it out. Boom! Bone broth + oats = duh! I like to get in as much bone broth as I can during the week. It's been one of the main components in helping me heal my gut. Plus, it's just such a good source of vitamins and minerals that I try to drink as much as possible. So, adding it to my oats seemed like a no-brainer. That's when this beautiful macro nutrient-dense breakfast baby was born. WHILE YOUR OATS ARE COOKING, START TO COOK UP YOUR TURKEY BACON IN A SAUTÉ PAN. (I LIKE TO CHOP MY BACON UP IN PIECES BEFORE ADDING TO THE PAN.) ONCE DONE COOKING REMOVE FROM PAN. ADD 1 CUP FROZEN SPINACH TO SAME PAN AS THE TURKEY BACON WAS COOKED IN. ADD AVOCADO OIL IF NEEDED. COVER AND COOK ON MEDIUM HEAT UNTIL READY TO SERVE. 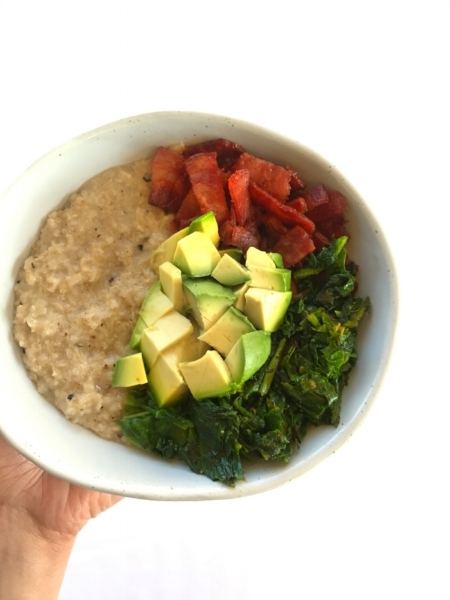 ONCE OATS ARE COOKED THROUGH, PUT IN YOUR FAVORITE BOWL AND TOP WITH THE GOODS. ENJOY!